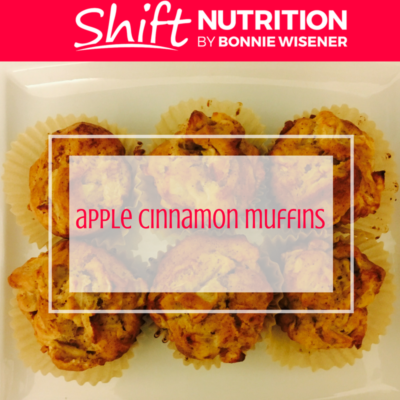 I ask you, what goes better together than apples and cinnamon? Definitely one of my favourite taste sensations. This recipe is a popular choice in our home, as well as with clients. It is an example of a ‘Shifted’ recipe. It is adapted from a recipe in one of my favourite cookbooks “Silver Platter” by Daniella Silver and Noreen Gilletz. You can make muffins or a ‘cake in a pan’. Filling: In a large bowl, combine all filling ingredients. Batter: In a medium sized bowl, beat eggs with sugar, apple sauce and vanilla. In a separate medium sized bowl, combine almond flour, baking powder, salt and cinnamon. Stir to combine. Add half of flour mixture to wet mixture. Blend in water, followed by the rest of the flour mixture. Mix well until combined. Fold in the apples, using a rubber spatula. Fill muffin cups 3/4 full or pour into greased baking pan. Muffins: Bake for 30 minutes until nicely browned on top. Makes about 2 dozen muffins. Cake: Bake for 50-60 minutes.